Broccoli is one of my all-time favorite veggies. I absolutely hated it when I was a kid. 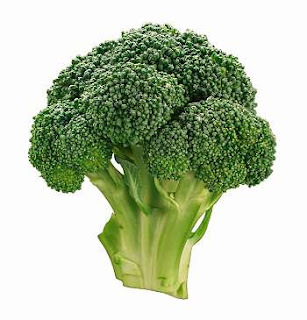 One of my mom's favorite one-liners from my childhood years was when I would frown down at my place and stubbornly state, "no bocci" (translation = no broccoli). As an adult I found a love for the steamed version of these tiny tree-shaped vegetables. I hate raw broccoli still, but cooked well it is completely delicious to my grown-up palate. Recently, one of my favorite ways to eat it is in soup form. It is always a challenge to find a balanced recipe that doesn't call for a ton of cheese or cream that completely masks the broccoli's flavor. I dug up this recipe from an old issue of Real Simple magazine and with a few adjustments it may be my favorite broccoli soup recipe yet! 1. Heat the oil in a large dutch oven over medium heat. Add the onion, salt, pepper and cayenne and cook, stirring frequently until the onion is soft (about 6 minutes). 2. Add the broth, water, broccoli, potato, 1/2 tsp. kosher salt and 1/2 tsp. fresh ground black pepper to the pot and bring to a boil. 3. Reduce heat and simmer until the veggies are tender, about 15-18 minutes. Use an immersion blender to blend the soup to the texture you like. I don't like my veggie soups to be completely smooth purees, so I leave bits of broccoli and potato whole for texture. 4. Add in the shredded cheddar cheese and stir until completely melted and smooth. Serve it up and enjoy! I always use soups to justify serving tomato-basil bruchetta, which I could eat by the truckload for sure.